Video of the Socialist Action Rebel Film night discussion that followed the screening of John Pilger’s documentary ‘Apatheid Did Not Die.’ Guest speaker, Ajamu Nangwaya, educator, and organizer with the Network for Pan-Afrikan Solidarity, spoke about the role of the ANC and Nelson Mandela in the perpetuation of economic apartheid in South Africa, and the need to build an anti-capitalist, working class alternative. 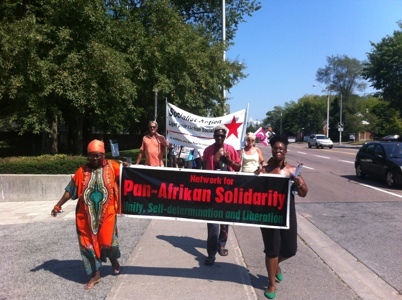 On Saturday afternoon, August 25, over one hundred people, including many representatives of labour, socialist, Latin American and Black community organizations, gathered in north Toronto outside the office of the South African Consulate to protest the police killing of more than forty mine workers at the Marikina Platinum Mine earlier that week. The following is the text of the statement presented to the gathering by Socialist Action. On behalf of Socialist Action / Ligue pour l’Action socialiste, I join in condemnation of the massacre of striking mineworkers and stand with you in solidarity with South African workers’ movement. The August 16 police offensive against thousands of striking workers from the Marikina Platinum Mine is an outrage in the eyes of the worldwide labour movement. The shooting and killing of more than 43 workers, and the wounding and arrest of hundreds more is an act of barbarity in the eyes of humanity. The mine is owned by U.K.-based Lonmin Corporation, the world’s third biggest platinum producer. It accounts for 12% of the world’s output of platinum. The working conditions of the mineworkers and the standard of living in their communities are horrid, which is why they went on strike. There are several things we need to keep in mind in this situation. First of all, do not forget that the Canadian business class, particularly giant mining bosses like Barrick Gold and Goldcorp are among the worst offenders when it comes to despoiling the environment, exploiting mine workers and suppressing unions. The Harper government is complicit with obscene Canadian mining practices in Latin America, Asia and Latin America. Harper is the advance man of the nature exploiters and union busters in this dirty business. The massacre of the Marikina miners also helps to place in context the crimes of Lonmin Corporation. Where the profits are highest, life is cheap on the balance sheet of the owners. This reinforces our demand that the mines and mills globally should be nationalized and operated under workers’ control, if they should be operated at all. But what about the government of South Africa. This is an African National Congress government, which campaigned against Apartheid. Together with the ANC in the Tripartite Alliance is the South African Communist Party. And yet, nearly 20 years after the 1993 transition that let the former white racist rulers off scot-free, the majority of South Africans suffer economic apartheid. The ANC pledged to implement its Freedom Charter. The Freedom Charter promised to nationalize the natural resources of the country. But what is the reality? The workers own nothing, and the mine bosses own the police! The state is the servant of the super-rich. Its goons in uniform shoot and kill strikers. ANC politicians issue apologies to the families of the stricken – after ensuring that the interests of the owners are secure. Many of us have been partisans of the anti-apartheid struggle for decades. Marching for human rights, demanding divestment, sanctions, and the boycott of S.African wines and other products. Here is another bitter lesson for the ages. This is what happens when a revolution stops half-way to victory. This is what happens when workers are betrayed by parties that purport to represent them. The fruits of their labour are hoarded in private vaults, and their best fighters are massacred by the cops of economic apartheid. So, we need to re-double our efforts for solidarity with the South African workers’ movement. We need to re-double our efforts to win justice for mine workers in South Africa, Asia and Latin America. We need to support the nationalization measures taken recently in Venezuela and Bolivia. We should understand that economic apartheid will end only through socialist revolution. Victory to the mine workers of South Africa. Solidarity forever. Workers to power!